The Department of Antiquities, Ministry of Communications and Works, announces the completion of the 2013 fieldwork season undertaken by the Italian Archaeological Mission (Università degli Studi di Firenze) at the site of Erimi-Laonin tou Porakou. This year’s excavations took place from 22 July to 20 August. 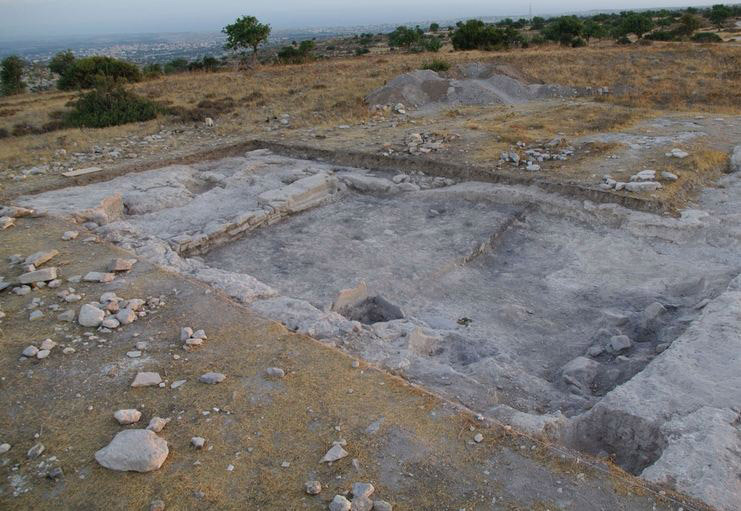 The Bronze Age site of Erimi-Laonin tou Porakou lies on a high plateau on the eastern river bank of the Kouris, just on the border between Ypsonas and Erimi villages of the Limassol District. The occupation sequence of the site consists of two main phases. The first and most significant one ranges from the Middle to the very beginning of the Late Bronze Age period (EC III/MCI- LC I). Afterwards the site was frequented only in the late-Hellenistic and Roman period, apparently following a lengthy abandonment. The focus of the 2013 season was to investigate three significant areas, different to each other in use: the top hill area (Area A), the domestic quarter (Area B) and the southern cemetery (Area E). The excavation in the workshop complex produced positive results and a collection of new data related both to the complex layout and the stratigraphy of the Bronze Age occupation of this productive area. The analysis of botanical remains from significant contexts, together with the evidence of coherent working installations (basins, channels) and object assemblages (spindle-whorls and loom weights, pouring vessels, containers) strengthen the hypothesis that weaving and textile dying were the main activities performed in the complex. At this point, the whole workshop complex extends over the 25×25 m. area currently investigated. Three new large rectangular rooms were cleared on the western and eastern wing of the complex with average dimensions of 10×5 m. A sudden collapse of the wall structures allowed the preservation of materials in their original place. Thus, a great number of vessels have been found in situ; a wide repertoire of shapes is attested (large Red-Polished pithoi, jugs, small spouted juglets), including a complete zooomorphic askos with a goat’s head. One of the rooms yielded an interesting collection of nine conical clay loom weights of different sizes. Investigations of the first lower terrace, where the domestic quarter is located (Area B), exposed the foundation structures of a house. The domestic unit is organized around an open rectangular court. Three new large rooms were revealed extending towards the North. The investigation of a stratigraphic deposit within Room 2 evidenced a sequence of two phases of occupation during the Middle Bronze Age, as previously pointed out in the case of the workshop complex. The South Cemetery area (Area E) extends over a series of terraces sloping towards the South-East of the settlement. Two additional graves have been excavated during this season. Chamber Tomb 248 is of particular interest with respect to its architecture and burial ritual. In fact, the large chamber dimensions (3,00x 2,00 m.) as well as the presence of a bench displayed in front of the entrance highlight the relevance of this grave context. Moreover, the human skeleton remains revealed two deposition floors with multiple inhumations of four adults, male and female, whose skulls were deliberately displayed on one side of the burial chamber at a second phase, possibly as part of the funerary ritual. As to the grave offerings, a rich assemblage of ceramic vessels comes from Tomb 248. The repertoire includes small and medium sized bowls, juglets and jars with applied and incised decoration as well as a collection of decorated clay spindle-whorls and stone beads. The typology and decoration patterns point to a typical South Coast Red Polished pottery production, whose date ranges from the beginning to the very end of Middle Bronze Age period, thus confirming the long-term use of this chamber for multiple burials. The fieldwork season involved a team of archaeologists with a joint support of a botanist, four anthropologists and a team of three restorers from the Universities of Turin and Florence.